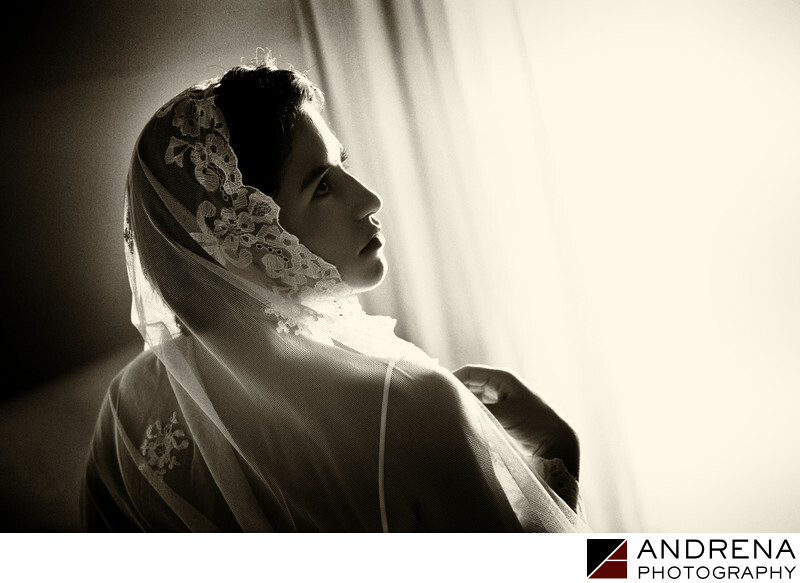 I love using rim light as an outline to a bride's facial features. For this photograph, taken at the Hotel Santa Clara in Cartagena, Colombia, I positioned myself on the shadow side of the bride and let the window light illuminate her profile. The light shining through her veil almost seemed to glow, which was really lovely, since this hotel is a former convent. This bride's cathedral-length veil featured stunning lace work on its border, which adds elegance to this image. It also helped to give her overall look a more timeless feel, almost as though the bride was from another time. I chose B&W for this image because I thought it enhanced the still quality of this moment. Wedding photographed at the Hotel Sofitel Santa Clara and Santo Domingo Church in Cartagena, Colombia.